Mohammad, A., Ajami, M., Abdollahi, M., Kolahi Ahari, G. (2016). A Review of the Relationship between Obesity and Food Insecurity. 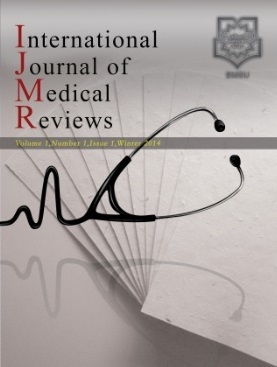 International Journal of Medical Reviews, 3(1), 381-388. Alimoradi Mohammad; Marjan Ajami; Morteza Abdollahi; Golbarg Kolahi Ahari. "A Review of the Relationship between Obesity and Food Insecurity". International Journal of Medical Reviews, 3, 1, 2016, 381-388. Mohammad, A., Ajami, M., Abdollahi, M., Kolahi Ahari, G. (2016). 'A Review of the Relationship between Obesity and Food Insecurity', International Journal of Medical Reviews, 3(1), pp. 381-388. Mohammad, A., Ajami, M., Abdollahi, M., Kolahi Ahari, G. A Review of the Relationship between Obesity and Food Insecurity. International Journal of Medical Reviews, 2016; 3(1): 381-388. Introduction: Food insecurity refers to the limited or unreliable access to sufficient quantity and quality of food or the restricted opportunities to obtain food through socially approved ways which turning into the major health concern , has been the cause of so many chronic diseases such as obesity. and the publication date being between 1995 and 2016. Conclusion: Due to similar affecting agents on the emerge of food insecurity and the obesity prevalence, there seems to exist direct associations between food insecurity and the obesity which could be obviously recognized among most of the age and gender groups. Holben, D. H., Taylor, C. A. Food Insecurity and Its Association With Central Obesity and Other Markers of Metabolic Syndrome Among Persons Aged 12 to 18 Years in the United States. The Journal,2015: 115(9), 536. Carlson, S. J., Andrews, M. S., Bickel, G. W. Measuring food insecurity and hunger in the United States: development of a national benchmark measure and prevalence estimates. The Journal of nutrition,1999: 129(2), 510S-516S. Godfray, H. C. J., Beddington, J. R., Crute, I. R., Haddad, L., Lawrence, D., Muir, J. F., Toulmin, C. Food security: the challenge of feeding 9 billion people. science,2010: 327(5967), 812-818. Pinstrup-Andersen, P. Food security: definition and measurement. Food security,2009: 1(1), 5-7. Insel, P., 2000. World view of nutrition: The faces of global malnutrition. IN: Discovering nutrition. Insel P.,Turner R.E., Ross D. American dietetic association. Pp. 592. Studdert LJ, Frongillo EA, Valois P. Household food insecurity was prevalent in Java during Indonesia's economic crisis. J Nutr 2001; 131: 2685-91. Piaseu N, Mitchell P. Household Food Insecurity Among Urban Poor in Thailand. J Nurs Scholarsh 2004; 36: 115-21. Zalilah MS, Lin KG. Indicators and Nutritional Outcomes of Household Food Insecurity among a Sample of Rural Malaysian Women. Pakistan J Nutr 2004; 3 : 50-5. Olson CM, Holben DH. Position of the American diet association: Domestic food and nutrition security. J Am Dietetic Assoc 2002; 102.1840-7. Nord M., Andrews M., Carlson S. Household food security in the United States, 2004. USDA-ERS Economic Research Report, 2005: (11). Che J, Chen J. Food insecurity in Canadian households. Health Rep 2001; 12: 11-22. Ogden CL, Flegal KM, Carroll MD, Johnson CL. Prevalence and trends in overweight among US children and adolescents, 1999-2000. JAMA 2002; 288: 1728-1732. Adams EJ, Grummer-Strawn L, Chavez G. Food insecurity is associated with increased risk of obesity in California women. J Nutr 2003; 133: 1070-4. Gibson D. Long-term food stamp program participation is differentially related to overweight in young girls and boys. J Nutr 2004; 134: 372-9. Jimenez‐Cruz, A., Bacardi‐Gascon, M. and Spindler, A.A., 2003. Obesity and hunger aming Mexican –Indian migrant children on the US‐ Mexico border. Int. J. Obes. 27, pp.740‐747. Matheson, D. M., Varady, J., Varady, A. and Killen, J., 2002. Household food security and nutritional ststus of overweight in woman. Journal of Nutrition. 131, pp. 1738‐1745. Popkin, B.M., 2001. The nutrition transition and obesity in the developing world. J. Nutr. 131, pp. 871S‐873S. Alaimo, K., Olsen, C.M. and Frongillo, E.D.J., 2001. Food insecurity and American school‐ aged children’s cognitive, academic, and psychosocial development. Pediatrics, 108, pp. 44‐ 53. Eckel RH, Grundy SM, Zimmet PZ. The metabolic syndrome. Lancet. 2005; 365(9468): 1415-28. Davidson M, Knafl KA. Dimensional analysis of the concept of obesity. J Adv Nurs, 2006; 54(3): 342-50. Papas, M. A., Trabulsi, J. C., Dahl, A., Dominick, G. Food Insecurity Increases the Odds of Obesity Among Young Hispanic Children. Journal of Immigrant and Minority Health,2015: 1-7. Kelly T, Yang W, Chen CS, Reynolds K, He J. Global burden of obesity in 2005 and projections to 2030. Int J Obes (Lond). 2008; 32(9): 1431-7. List, J. A., Samek, A. S. The behavioralist as nutritionist: leveraging behavioral economics to improve child food choice and consumption. Journal of health economics,2015: 39, 135-146. Qureshi, M. E., Dixon, J., Wood, M. Public policies for improving food and nutrition security at different scales. Food Security,2015: 7(2), 393-403. Leung CW, Williams DR, Villamor E. Very low food security predicts obesity predominantly in California Hispanic men and women. Public Health Nutr. 2012;1(1):1–9. Finney Rutten, L., Yaroch, A. L., Patrick, H., Story, M. Obesity prevention and national food security: a food systems approach. ISRN Public Health, 2012. Dietz WH. Does hunger cause obesity? Pediatrics. 1995;95(5): 766–7. Dinour LM, Bergen D, Yeh MC. The food insecurity–obesity paradox: a review of the literature and the role food stamps may play. J Am Diet Assoc. 2007; 107(11):1952–61. Franklin, B., Jones, A., Love, D., Puckett, S., Macklin, J., White-Means, S. Exploring mediators of food insecurity and obesity: A review of recent literature. Journal of Community Health,2012: 37, 253–264. Pereira, R. A., Duffey, K. J., Sichieri, R., Popkin, B. M. Sources of excessive saturated fat, trans fat and sugar consumption in Brazil: an analysis of the first Brazilian nationwide individual dietary survey. Public health nutrition,2014: 17(01), 113-121. Kuku O, Garasky S, Gundersen C. The relationship between childhood obesity and food insecurity: a nonparametric analysis. Appl Econ. 2012;44(21):2667–77. Speirs, K. E., Fiese, B. H., STRONG Kids Research Team. The Relationship Between Food Insecurity and BMI for Preschool Children. Maternal and child health journal,2015: 1-9. Larson, N. I., Story, M. T. Food insecurity and weight status among US children and families: a review of the literature. American journal of preventive medicine,2011: 40(2), 166-173. 35. Metallinos-Katsaras, E., Sherry, B., Kallio, J. Food insecurity is associated with overweight in children younger than 5 years of age. Journal of the American Dietetic Association,2009: 109(10), 1790–1794. Bhattacharya, J., Currie, J., Haider, S. Poverty, food insecurity, and nutritional outcomes in children and adults. Journal of Health Economics,2004: 23(4), 839–862. Casey, P. H., Simpson, P. M., Gossett, J. M., et al. The association of child and household food insecurity with childhood overweight status. Pediatrics,2006: 118(5), e1406–e1413. Jyoti, D. F., Frongillo, E. A., Jones, S. J. Food insecurity affects school children’s academic performance, weight gain, and social skills. Journal of Nutrition,2005: 135(12), 2831–2839. Cook JT, Frank DA, Berkowitz C, Black MM, Casey PH, et al. Food insecurity is associated with adverse health outcomes among human infants and toddlers. J Nutr. 2004;134(6):1432–8. Seligman HK, Laraia BA, Kushel MB. Food insecurity is associated with chronic disease among low-income NHANES participants. J Nutr. 2010; 140(2):304–10. Holben, D. H., & Pheley, A. M. Diabetes risk and obesity in food-insecure households in rural Appalachian Ohio. Prev Chronic Dis,2006: 3(3), A82. Drewnowski A, Specter S. Poverty and obesity: the role of energy density and energy costs. Am J Clin Nutr. 2004;79:6–16. Isanaka S, Mora-Plazas M, Lopez-Arana S, Baylin A, Villamor E. Food insecurity is highly prevalent and predicts underweight but not overweight in adults and school children from Bogota, Colombia. J Nutr. 2007;137(12):2747–55. Pan L, Sherry B, Njai R, Blanck HM. Food insecurity is associated with obesity among US adults in 12 states. J Acad Nutr Diet. 2012;112(9):1403–9. Martin MA, Lippert AM. Feeding her children, but risking her health: the intersection of gender, household food insecurity and obesity. Soc Sci Med. 2012;74:1754–64. Townsend MS, Peerson J, Love B, Achterberg C, Murphy SP. Food insecurity is positively related to overweight in women. J Nutr. 2001;131(6):1738–45. Ogden CL, Carroll MD, Kit BK, Flegal KM. Prevalence of obesity and trends in body mass index among U.S. children and adolescents, 1999–2010. JAMA. 2012;307(5):483–90. Farley, T. A., Meriwether, R. A., Baker, E. T., Watkins, L. T., Johnson, C. C., Webber, L. S. Safe play spaces to promote physical activity in inner-city children: results from a pilot study of an environmental intervention. American journal of public health,2007: 97(9), 1625-1631. Johnson, J. A., Johnson, A. M. Urban-rural differences in childhood and adolescent obesity in the United States: A systematic review and meta-analysis. Childhood Obesity,2015: 11(3), 233-241. Liu J-H, Jones SJ, Sun H, Probst JC, Merchant AT, Cavicchia P. Diet, physical activity, and sedentary behaviors as risk factors for childhood obesity: an urban and rural comparison. Childhood Obesity (Print). 2012;8(5):440-448. Befort CA, Nazir N, Perri MG. Prevalence of obesity among adults from rural and urban areas of the United States: findings from NHANES (2005-2008). The Journal Of Rural Health: Official Journal Of The American Rural Health Association And The National Rural Health Care Association. 2012;28(4):392-397. Rose-Jacobs R, Black MM, Casey PH, et al. Household food insecurity: associations with at-risk infant and toddler development. Pediatrics. 2008;121(1):65-72. McLaughlin KA, Green JG, Alegría M, et al. Food insecurity and mental disorders in a national sample of U.S. adolescents. Journal of the American Academy of Child and Adolescent Psychiatry. 2012;51(12):1293-1303. Martin-Fernandez, J., Caillavet, F., Lhuissier, A., Chauvin, P. Food Insecurity, a Determinant of Obesity?-an Analysis from a Population-Based Survey in the Paris Metropolitan Area, 2010. Obesity facts, 2014: 7(2), 120-129. Gooding HC, Walls CE, Richmond TK: Food insecurity and increased BMI in young adult women. Obesity (Silver Spring) 2012; 20: 1896–1901. Kac, G., Velasquez-Melendez, G., Schlüssel, M. M., Segall-Côrrea, A. M., Silva, A. A., Pérez-Escamilla, R. Severe food insecurity is associated with obesity among Brazilian adolescent females. Public health nutrition,2012: 15(10), 1854-1860. Velasquez-Melendez G, Schlussel MM, Brito AS et al. Mild but not light or severe food insecurity is associated with obesity among Brazilian women. J Nutr,2011: 141, 898–902. Robaina, K. A., Martin, K. S. Food insecurity, poor diet quality, and obesity among food pantry participants in Hartford, CT. Journal of nutrition education and behavior,2013: 45(2), 159-164. Nackers, L. M., Appelhans, B. M. Food insecurity is linked to a food environment promoting obesity in households with children. Journal of nutrition education and behavior,2013: 45(6), 780-784. Dhokarh R, Himmelgreen DA, Peng YK, Segura-Perez S, Hromi-Fiedler A,Perez-Escamilla R. Food insecurity is associated with acculturation and social networks in Puerto Rican households. J Nutr Educ Behav. 2011;43:288-294. Dammann K, Smith C. Food-related attitudes and behaviors at home, school, and restaurants: perspectives from racially diverse, urban, low-income 9- to 13-year-old children in Minnesota. J Nutr Educ Behav. 2010;42:389-397. Story, M., Hamm, M. W., Wallinga, D. Food systems and public health: linkages to achieve healthier diets and healthier communities. Journal of hunger & environmental nutrition,2009: 4(3-4), 219-224. Kursmark, M., Weitzman, M. Recent findings concerning childhood food insecurity. Current Opinion in Clinical Nutrition & Metabolic Care,2009: 12(3), 310-316. Giang, T., Karpyn, A., Laurison, H. B., Hillier, A., Perry, R. D. Closing the grocery gap in underserved communities: the creation of the Pennsylvania Fresh Food Financing Initiative. Journal of Public Health Management and Practice,2008: 14(3), 272-279. Kohn, M. J., Bell, J. F., Grow, H. M. G., Chan, G. Food insecurity, food assistance and weight status in US youth: new evidence from NHANES 2007–08. Pediatric obesity,2014: 9(2), 155-166. Gundersen C, Lohman BJ, Garasky S, Stewart S, Eisenmann J. Food security, maternal stressors, and overweight among low-income US children: results from the National Health and Nutrition Examination Survey (1999–2002). Pediatrics. 2008; 122(3):e529–540. Lohman, B. J., Stewart, S., Gundersen, C., Garasky, S., Eisenmann, J. C. Adolescent overweight and obesity: links to food insecurity and individual, maternal, and family stressors. Journal of Adolescent Health,2009: 45(3), 230-237. Jenkins S, Rew L, Sternglanz R. Eating behaviors among school-aged adolescents associated with perceptions of stress. Issues Compr Pediatr Nurs 2005;28:175–91. Nicklas TA, Yang S, Baranowski T, et al. Eating patterns and obesity in adolescents. Am J Prev Med 2003;24:9–16. Smith C, Richards R. Dietary intake, overweight status, and perceptions of food insecurity among homeless Minnesotan youth. American Journal of Humann Biology. 2008; 20(5):550–563. Hanson KL, Sobal J, Frongillo EA. Gender and marital status clarify associations between food insecurity and body weight. Journal of Nutrition. 2007; 137(6):1460–1465. Sullivan AF, Clark S, Pallin DJ, Camargo CA. Food security, health, and medication expenditures of emergency department patients. Journal of Emergency Medicine. 2010; 38(4):524–528. Bronte-Tinkew J, Zaslow M, Capps R, Horowitz A, McNamara M. Food insecurity works through depression, parenting, and infant feeding to influence overweight and health in toddlers. J Nutr 2007; 137(9):2160 –5. Olson C, Strawderman M. The relationship between food insecurity and obesity in rural childbearing women. J Rural Health 2008; 24(1):60–6. Catalano P. Obesity and pregnancy—the propagation of a viscous cycle? J Clin Endocrinol Metab 2003;88:3505– 6. McMillen IC, Robinson JS. Developmental origins of the metabolic syndrome: prediction, plasticity, and programming. Physiol Rev 2005;85(2):571– 633. Armitage J, Khan I, Taylor P, Nathanielsz P, Poston L. Developmental programming of the metabolic syndrome by maternal nutritional imbalance:how strong is the evidence from experimental models in mammals? J Physiol 2004;561(Pt 2):355–77. Furness BW, Simon PA, Wold CM, Anderson J. Prevalence and predictors of food insecurity among low-income households in Los Angeles County.Public Health Nutrition 2004; 7: 791-94. Quandt SA, Shoaf JI, Tapia J, Hernandez-Pelletier M, Clark HM, Arcury TA. Experiences of Latino immigrant families in North Carolina help explainelevated levels of food insecurity and hunger. Journal of Nutrition 2006; 136: 2638-44. Frongillo AE, Nanama S. Development and validation of an experience-based measure of household food Insecurity within and across seasons in Northern Burkina Faso. Journal of Nutrition 2006; 136: 1409S-19S. Sarlio-Lähteenkorva S, Lahelma E. Food insecurity is associated with past and present economic disadvantage and body mass index. Journal of Nutrition 2000; 131: 2880-84. Kirkpatrick SI, Tarasuk V. Food insecurity is associated with nutrient inadequacies among Canadian adults and adolescents. Journal of Nutrition 2008; 138: 1399. Usfar AA, Fahmida U, Februhartanty J. Household food security status measured by the US-Household Food Security/Hunger Survey Module (US-FSSM) is in line with coping strategy indicators found in urban and rural Indonesia. Asia Pacific Journal of Clinical Nutrition 2007; 16: 368-74. Panigassi G, Segall-Corrêa AM, Marin-León L, Pérez-Escamilla R, Sampaio Mde F, Maranha LK. Food insecurity as an indicator of inequity: analysis of a population survey. Cadernos de Saude Publica 2008; 24: 2376-84. Karnik, A., Foster, B. A., Mayer, V., Pratomo, V., McKee, D., Maher, S., Anderson, M. Food insecurity and obesity in New York City primary care clinics. Medical Care,2011: 49(7), 658-661. Eisenmann, J. C., Gundersen, C., Lohman, B. J., Garasky, S., Stewart, S. D. Is food insecurity related to overweight and obesity in children and adolescents? A summary of studies, 1995–2009. Obesity Reviews,2011: 12(5), e73-e83.